Wheels allow your car’s tires to bolted to your vehicle’s axles, but they can also add to its style and performance. Some wheels are still made from traditional steel and include a decorative hub cap, but many of today’s wheels are cast or forged from advanced steels alloys, aluminum alloys, or even magnesium or cutting-edge carbon fiber. Wheels must translate your car’s accelerating, braking, and turning forces to the road while holding your tires in place and helping them maintain pressure. Changing your vehicle’s wheels can transform and personalize its visual appearance and enhance its driving and handling characteristics, so it’s no surprise that wheels are one of the most popular changes people make to their vehicles. Action Gator Tire serves drivers throughout Central and South Florida with full-service wheel sales, installation, and balancing services. If you’re in the market for a new set of wheels, we’re your go-to source for all your needs. At Action Gator Tire, we offer a huge selection of wheels from all the biggest names in the industry. Whether you need to replace a damaged wheel or want a new set of wheels for flashy style, understated elegance, or top performance, we have you covered! We have high-quality wheel options for all types of passenger cars, trucks, SUVs, and even commercial vehicles. Plus, whether you buy a single replacement wheel or an entire set of four, we’ll be happy to help you with precise tire mounting and wheel installation services. Once your tires are mounted to your new wheels, it’s very important to make sure they’re perfectly balanced for a smooth, quiet ride and no harmful vibrations. 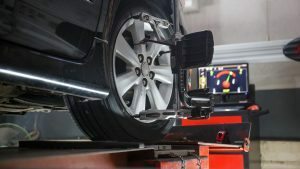 To do this, we use cutting-edge computerized machinery to spin each wheel and tire at high speeds to measure their balance and recommend exactly where to place wheel weights to counteract imbalance. Once we’ve retested and confirmed your new wheels and tires are perfectly balanced, we’ll be ready to mount them to your vehicle and get you back on the road with your fresh look and enhanced performance.